SpongeBob SquarePants is a world-renowned and beloved character-driven animated series that chronicles the nautical and sometimes nonsensical adventures of SpongeBob, an incurably optimistic and earnest sea sponge, and his undersea friends. Since debuting on Nickelodeon in 1999, the animated series quickly gained immense popularity and has remained a household name for over a decade, captivating children and adults alike with its colorful and eclectic cast of characters. 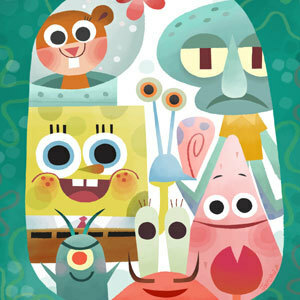 Created and executive produced by marine biologist and animator, Stephen Hillenburg, SpongeBob SquarePants is one of Nickelodeon's longest-running series, with nearly 200 episodes airing on the network. Jumpin' jellyfish, that's a lot! Nucleus and Nickelodeon have partnered up to present a tribute to our absorbent, yellow and porous friend, SpongeBob. The collection will feature work from a wide spectrum of artists, including a few of the show's very own. Neptune himself would be excited to see this! Stay tuned for more details about opening night festivities, special releases, plus a very rare behind-the-scenes glimpse at the art technique and style of the series. Over two dozen works on loan from Nickelodeon including original animation cels, character designs, and acrylic paintings from season one. Plus, we are excited to feature six 3D figures used in the stop motion special, "It's a SpongeBob Christmas." • Complimentary Refreshments & More! DON'T MISS artists from SpongeBob Comics greeting fans and signing copies of the series available for sale during opening night! © 2013 Viacom International Inc. All rights reserved. Nickelodeon, SpongeBob SquarePants and all related titles, logos and characters are trademarks of Viacom International Inc. SpongeBob SquarePants created by Stephen Hillenburg.